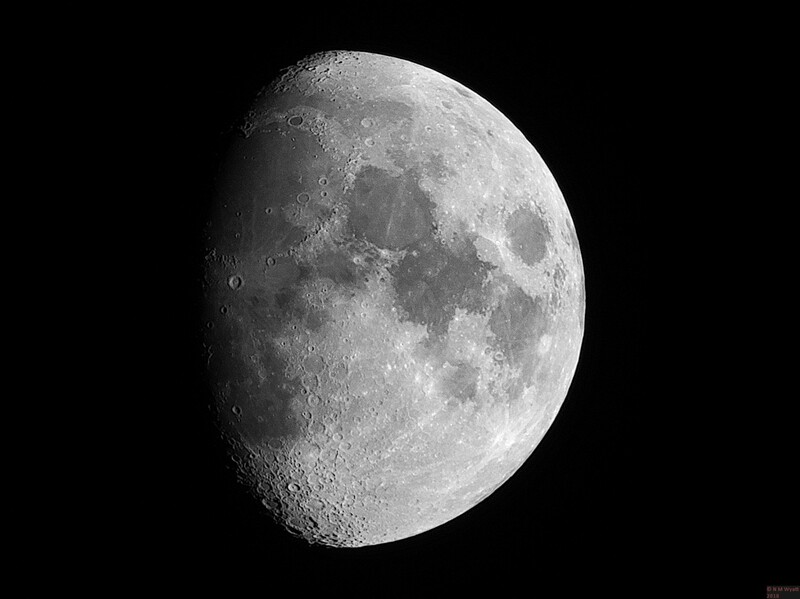 You are never too old to learn, and one of the thing that has opened my eyes has been discovering the quality of astronomical images that can be produced by amateurs with very modest equipment. By using digital cameras and image processing software it's a realistic ambition to produce images that compare favourably with those produced by the world's biggest telescopes fifty years ago - right in your back yard! This website does not showcase the best astronomical pictures on the internet! It's a selection of pictures I have taken myself with basic equipment and free software. Producing images like these below, or even better ones, is within your reach! Most importantly, you don't have to spend a fortune. My first serious scope, mount and tripod cost £180 on Ebay. I spent £40 on a more solid tripod, and about £200 on various bits and pieces including books and an ancient Canon EOS DSLR and a seconhand Microsoft HD Webcam. The results shown before are some of my best so far, and will be updated from time to time. A gibbous moon photographed on the isle of Skye. I hope I have convinced you to have a go at photographing the night sky - these photos may not hold a candle to some of the work of professionals like Damian Peach or even dedicated amateurs, but I hope you are surprised what can be done with kit that has cost me well under £500. There are lots of places to find out more on line, but perhaps the easiest place to start is the StargazersLounge webiste. As well as the subjects covered above there are all sorts of other things to look out for - comets, asteroids, meteors, aurorae, noctilucent clouds and various metereological effects such as sundogs and lunar halos. 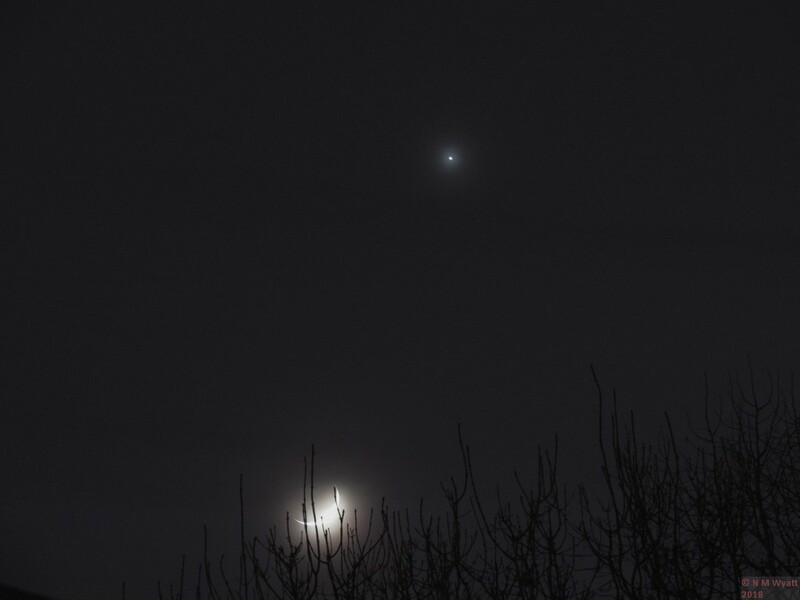 And sometimes there are just picturesque events such as this near conjunction of the Moon and Venus. Rotanev Svalocin - Forgotten Hero? The inconspicuous little constellation Delphinus has a the shape of a diamond with a short tail. Although unlike many constellations it at least vaguely resembles its namesake - some people think it is more like a kite than a dolphin. Once seen in the sky, there is little reason to keep staring, especially as the riches of the Milky Way are nearby. But the two brightest stars, alpha and beta Delphinus have an interesting history, being named Svalocin and Rotanev. To me the names suggest a hero of the Russian Revolution, but they were named far earlier, and they have a much more interesting story. cacaphonous and barbaric ... no prying into the black-letter versions of the Almagest, El Battani, Ibn Yunis, and other authorities enables one to form any rational conjecture as to the mis-reading, mis-writing or mis-application in which sostrange a metamorphosis could have originated. He said that Rotanev "putteth derivation and etymology at defiance" . He appears to have thought they were made up nonsense, but couldn't prove it. An even less famous British Astronomer was the Rev. Thomas W. Webb, though he was a populariser of amateur astronomy his book Celestial Objects of 1859 was very successful (and well worth reading). In Celestial Objects he wrote of Smyth's confusion with thinly disguised smugness: "Where so eminent and accomplished a scholar and antiquarian has not succeeded, it would seem presumptious to offer a solution". But, unable to restrain his delight at having cracked the puzzle of Svalocin and Rotanev, that's exactly what de did. He simply reversed the names to get the words Nicolavs Venator, which he easily recognised as a latinised version of the name Niccolo Cacciatore (venator in Latin and cacciatore in Italian both mean 'Hunter' - I'm sure you recognised versions of 'Nicholas'). He also knew that Italian astronomer Niccolo Cacciatore was an assistant at the Palermo Observatory at the time the catalogue in which these stars were first named was being prepared. There aren't many mortal beings who get to have a star that can be seen by the naked eye named after them. Rotanev Svalocin AKA Niccolo Cacciatore, you are officially a dude - respect! 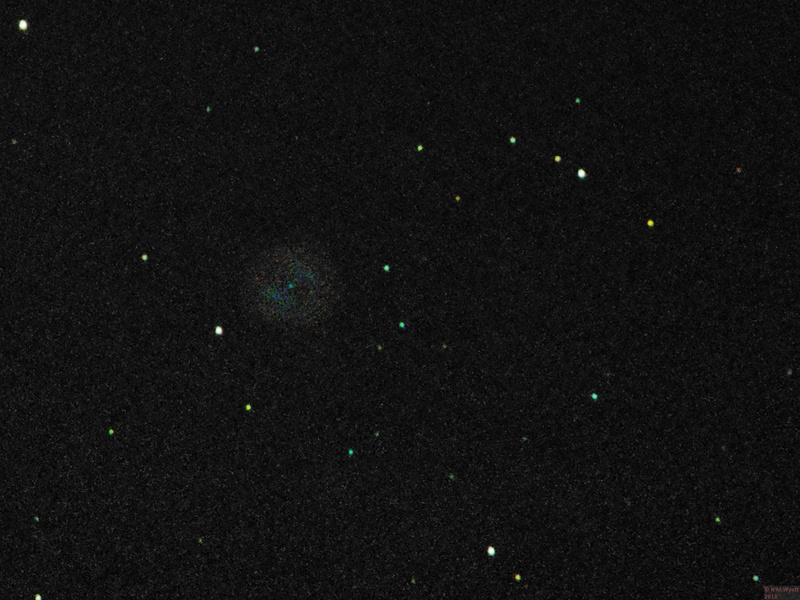 M97 is one of the few planetary nebulae on Messier's list. It lies just under the 'blade' of he Plough, near the galaxy M108. At its centre is a white dwarf star, the remains of the star that shed the great cloud of dust we now see as the nebula. The two dark patches that give the nebula its name are caused by one of the 'shells' of gas having a hollow a barrel shape. The photo below is only from three subs, taken whilst trying to track down M108. 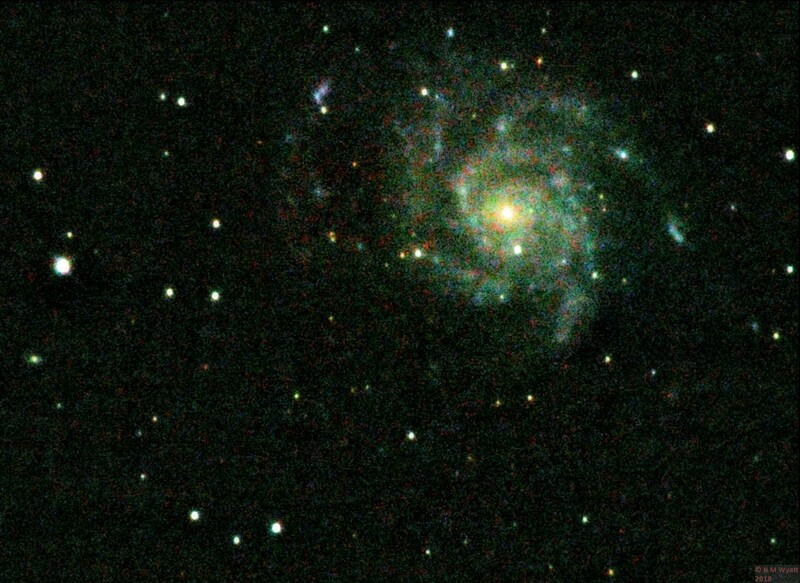 It will be updated when a better image is available, but for now you can just make out the blue-green colour, the two dark patches and the hint of three stars including the central white dwarf. 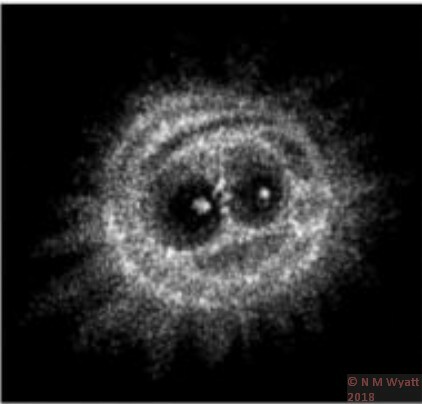 Here is Lord Rosse's famous drawing of the Owl Nebula, imaginative but not bad for a visual observation, although he moved the central star into an eye socket. One of his clerical friends suggested it looked like 'the visage of a monkey'. Quite an engaging little chap if you ask me. 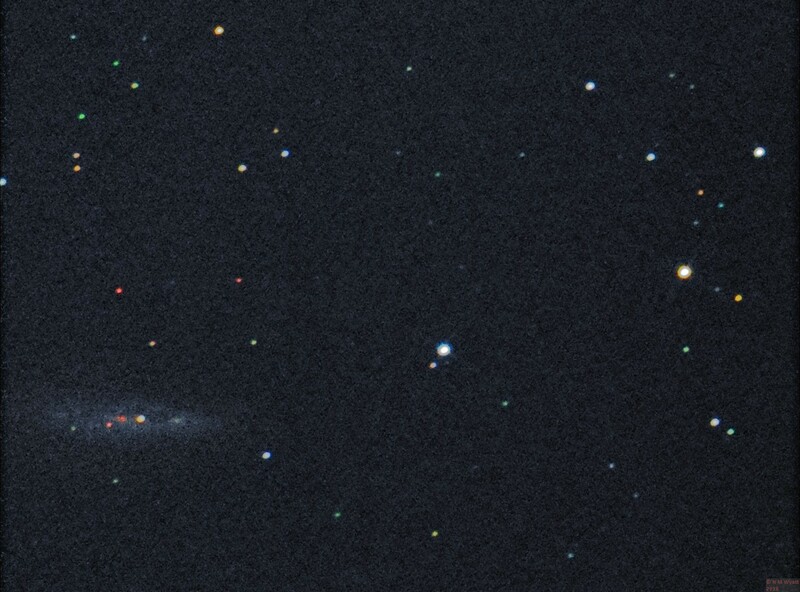 M108 is was discovered by Messier's colleague Pierre Mechain in the 1870s. It is a barred spiral galaxy in the consetellation of Ursa Major, but to see this you need much more detailed shot than the one below. This is a stack of five rather short exposures against a background of light pollution, I was pleased to get any detail at all in this image, as I was just expecting a blurred streak! 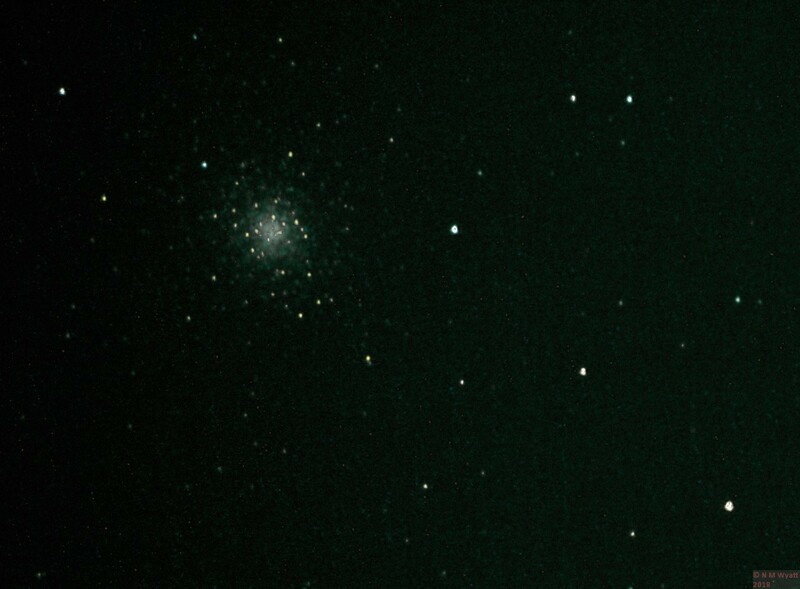 M92 is a quite bright globular cluster above the constellation of Hercules. It is hard to see with the naked eye, but easily observable in binoculars. Perhaps the most fascinating thing about this cluster is that its age has been estimated to being about the same as the age of the universe - in other words it is one of the oldest objects it is possible to observe.